See the images of cardiac calcifications below. 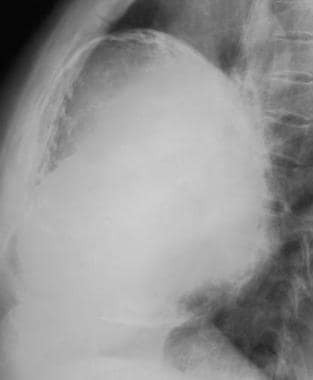 Frontal chest radiograph demonstrates a large calcified pericardial cyst. Courtesy of Mysore Seetharaman, MD. 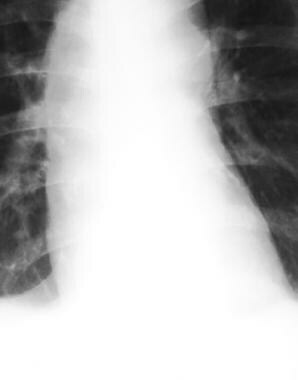 Frontal chest radiograph reveals calcification involving the ascending aorta in a patient with syphilitic aortitis. Courtesy of Mysore Seetharaman, MD. 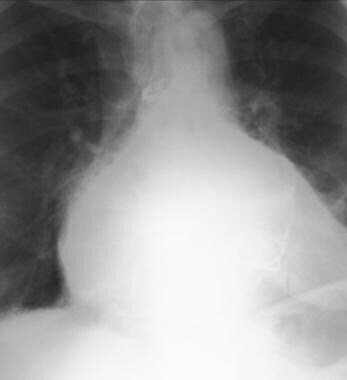 Lateral chest radiograph of the same patient shown in the previous image reveals calcified pericardial cyst. On chest radiographs, pericardial calcification appears as curvilinear calcification usually affecting the right side of the heart (see the images below). Note the calcification along the left heart border over the right ventricle in this patient with calcific pericarditis. On the lateral view, thick nodular calcification is observed over the right ventricle, representing pericardial calcification. 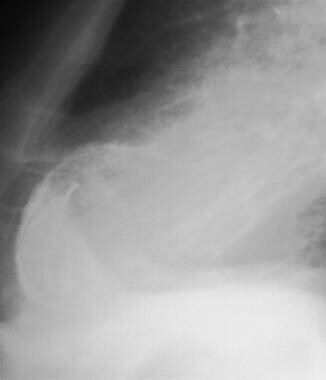 This is often visualized better on lateral chest radiographs than on frontal views. Calcifications associated with tuberculous pericarditis present as thick, amorphous calcifications along the atrioventricular groove. This pattern may be observed less commonly with other forms of pericarditis as well. CT is the best technique to detect pericardial calcification  ; however, overpenetrated films, conventional tomography, fluoroscopy, and MRI may be helpful. Myocardial calcification usually occurs in patients who have sustained sizable infarcts. Calcification is identified as thin and curvilinear shaped and usually appears toward the apex of the LV. The associated contour abnormality from the aneurysm is frequently noted. 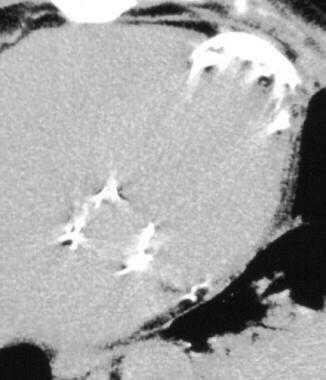 Rarely, calcification can appear spherical or platelike. The walls of the LV rarely calcify, and calcification of the mural thrombus in the aneurysm is more common. 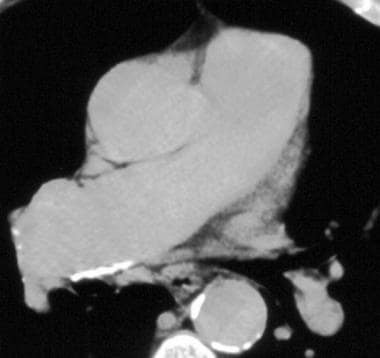 Rarely, calcification is noted in cardiac tumors, such as rhabdomyomas and endotheliomas. The CTs and radiograph below show a patient with calcification in a left ventricular aneurysm. Lateral chest radiograph from the patient shown in the previous image demonstrates calcification within the left ventricular aneurysm. Non–contrast-enhanced CT of the patient seen in the previous 2 images reveals calcification within the left ventricular aneurysm. Detection of left atrial wall calcification has significant clinical implications. Most of these patients have congestive heart failure and atrial fibrillation from long-standing mitral valve disease. 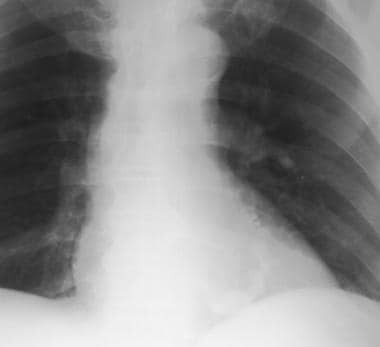 LA calcification usually is secondary to endocarditis resulting from rheumatic heart disease, and the amount of calcification is often related to the duration of untreated disease. LA calcification may be in the endocardial or subendocardial layer or within a thrombus. Calcification is usually thin and curvilinear, as can be seen in the radiographs below. Valvular calcification identified radiographically suggests the presence of a hemodynamically significant stenosis. Dominant valvular insufficiency is not associated with radiographic depiction of calcification, except in patients with calcified stenotic valves secondarily destroyed by endocarditis. The aortic valve calcification is detected most frequently. In bicuspid aortic valves, calcification may be nodular, semilunar, or mushroom shaped. A dilated ascending aorta often is seen. 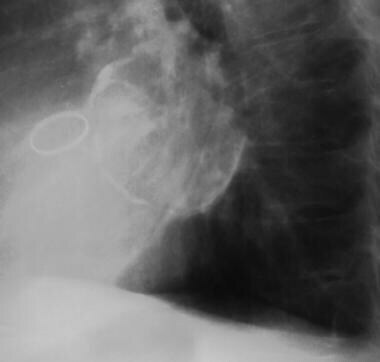 A thick, irregular, semilunar ring pattern with a central bar or knob is typical of stenotic bicuspid valves and results from calcification of the valve ring and the dividing ridge of the 2 cusps or the conjoined leaflet, as seen in the radiograph below. In mitral valve calcification, a nodular or amorphous pattern of calcification is observed, and signs of rheumatic mitral stenosis frequently are present. 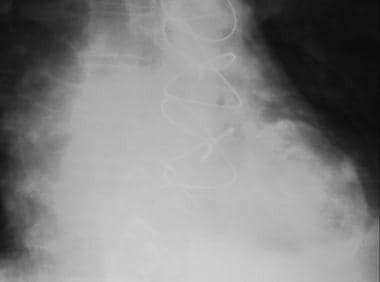 These include enlargement of the LA, especially the LA appendage, and pulmonary venous hypertension with cephalization and interstitial edema seen as Kerley B lines. Detection of mitral valve calcification from chest radiographs is uncommon; echocardiographic detection is far more common. Detection of the calcification has surgical implications, since in such instances valve replacement is preferred to commissurotomy. Calcification of the pulmonary valve occurs rarely in patients with pulmonary valvular stenosis. If valve calcification is identified radiologically, the gradient across the valve often exceeds 80 mm Hg; valvar calcification also may be observed in patients with long-standing, severe pulmonary hypertension. Tricuspid valve calcification is rare and most frequently is caused by rheumatic heart disease; however, it has been associated with septal defects, congenital tricuspid valve defects, and infective endocarditis. Annular calcification is a degenerative process. A, J, U, or reverse C-shaped bandlike calcification is observed involving the mitral annulus. Calcification can appear O-shaped if the anterior leaflet also is involved. 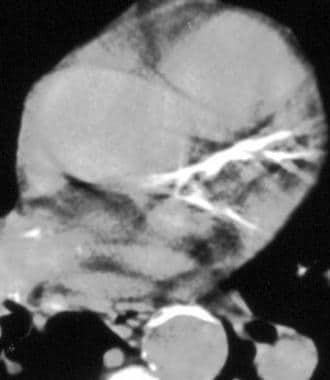 Calcification appears bandlike and of uniform radiopacity compared to the nodular and more irregular opacity of mitral valve calcification, as shown in the radiograph below. Syphilitic aortitis, an inflammatory aortitis involving the ascending aorta, sinuses of Valsalva and the aortic valve, is associated with aortic insufficiency, ascending aortic aneurysms, and a positive serologic test for syphilis. In these patients, calcification occurs in a linear pattern along the ascending aorta. 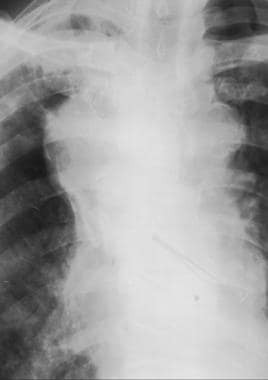 On gross specimen examination, the aorta has been described as revealing a "tree-bark" appearance, as shown in the frontal chest radiograph below. 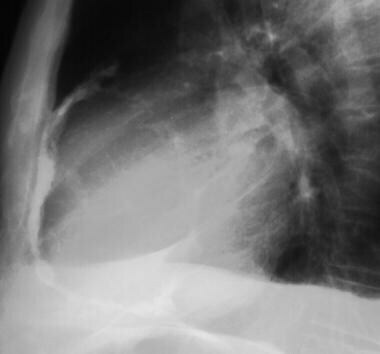 Calcification of the pulmonary artery is rare and almost always represents long-standing pulmonary hypertension. It may involve the main and/or central pulmonary arteries (see the images below). 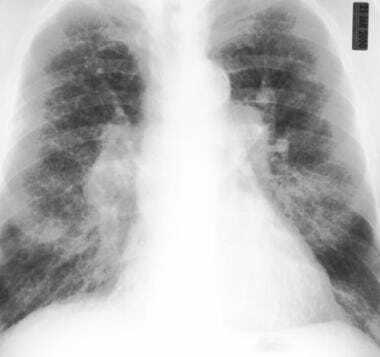 Frontal chest radiograph in the same patient as in the previous image reveals changes of diffuse, interstitial lung disease. 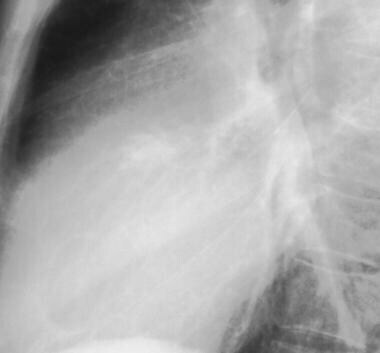 Pulmonary artery calcification is barely visualized. 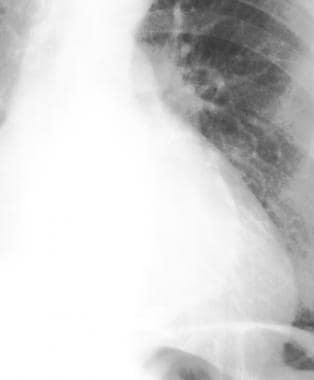 Calcification of the ductus arteriosus is observed on a frontal chest radiograph as a curvilinear or nodular density between the aorta and pulmonary trunk. Evaluation of patients with coronary artery disease (CAD) includes patient history (including review of symptoms and significant coronary risk factors), physical examination, and evaluation of a resting ECG. In patients with symptoms suggestive of CAD, additional investigation, including the physiologic response to stress, may be indicated. This may include stress ECG, stress echocardiography or MRI, or radionuclide perfusion imaging. Coronary calcification is a recognized marker for atherosclerotic CAD. Calcification can be identified on plain radiographs, fluoroscopy, and CT. More reproducible CT evaluation, including quantitation of coronary calcium, may be performed using helical and electron beam CT (EBCT). Physicians are increasingly using CT detection of calcification to detect subclinical CAD, which may result in early initiation of diet and drug therapy. 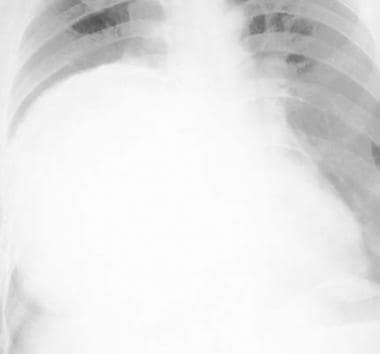 Frontal chest radiograph demonstrates calcification involving the left anterior descending coronary artery. EBCT minimizes motion artifacts, since cardiac-gated imaging can be triggered by the R wave of the cardiac cycle. Imaging can be performed in diastole, minimizing cardiac motion. Typically, 20 contiguous, 100-millisecond, 3-mm thick sections are obtained during 1 or 2 breath-holds. Coronary calcification is observed as a bright white area along the course of coronary vessels. Helical non–contrast-enhanced CT reveals calcification involving the left main coronary artery. Coronary calcifications detected on EBCT or helical CT can be quantified, and a total calcification score can be calculated. In this schematic, an arbitrary pixel threshold of +130 Hounsfield units (HU) (+90 for some helical scanners) covering an area greater than 1.0 mm often is used to detect coronary artery lesions. Regions of interest are placed around the area of calcification. Once the region of interest is placed, scanner software displays peak calcification, attenuation in HU, and area of the calcified region in millimeters squared. The volume or Agatson score is displayed. The volume score is the area of the lesion, while the Agatson score is weighted to consider attenuation of pixels, as well as the area. In the Agatson scoring system, +130-200 HU lesions are multiplied by a factor of 1, +201-300 HU by 2, +301-400 HU lesions by 3, and lesions greater than 401 HU are multiplied by a factor of 4. The sum of the individual lesion scores equals the score for that artery, and the sum of all lesion scores equals the total calcification score. In one study, a total calcification score of 300 had a sensitivity of 74% and a specificity of 81% in detecting obstructive CAD. The negative predictive value of a zero calcification score was 98%. In another study, sensitivity for detecting calcific deposits in patients with angiographically significant stenosis was 100%, and specificity was 47%. In the same study, 8 patients without calcification showed no angiographic evidence of CAD, while 28 patients with calcification showed mild or moderate CAD. However, despite the high sensitivity of EBCT, calcification scores do not always predict significant stenosis at the site of calcification. [32, 33] In another study, EBCT was compared with coronary angiography; only 1 patient with stenosis greater than 50% on angiography did not demonstrate coronary calcification on EBCT. Thus, absence of calcification appears to be a good predictor of the absence of significant luminal stenosis. However, absence of calcification does not always indicate the absence of atherosclerotic plaque. A multicenter study reviewed cardiac event data in 501 mostly symptomatic patients with CAD who underwent both EBCT and coronary angiography. In this group, 1.8% of patients died and 1.2% had nonfatal myocardial infarctions during a mean follow-up period of 31 months. A calcification score of 100 or more was revealed to be highly predictive in separating patients with from those without cardiac events. Bogaert J, Francone M. Pericardial disease: value of CT and MR imaging. Radiology. 2013 May. 267(2):340-56. [Medline]. Roosens B, Bala G, Gillis K, Remory I, Droogmans S, Somja J, et al. Echocardiographic integrated backscatter for detecting progression and regression of aortic valve calcifications in rats. Cardiovasc Ultrasound. 2013 Jan 26. 11:4. [Medline]. [Full Text]. Becker A, Leber AW, Becker C, von Ziegler F, Tittus J, Schroeder I, et al. Predictive value of coronary calcifications for future cardiac events in asymptomatic patients with diabetes mellitus: a prospective study in 716 patients over 8 years. BMC Cardiovasc Disord. 2008 Oct 10. 8:27. [Medline]. Becker A, Leber A, Becker C, Knez A. Predictive value of coronary calcifications for future cardiac events in asymptomatic individuals. Am Heart J. 2008 Jan. 155(1):154-60. [Medline]. George P, Badekila AK, Hegde N, Byregowda HS. Unusual 'Tick Mark' Calcification on Chest Radiograph in Rheumatic Heart Disease - CT Imaging Revealing Pericardial Calcification. J Clin Diagn Res. 2013 Apr. 7(4):787-8. [Medline]. [Full Text]. Salgado RA, Shivalkar B, Parizel PM, Vrints C. Left atrial calcifications: computed tomographic imaging findings of an unusual sign of rheumatic heart disease. J Comput Assist Tomogr. 2008 Sep-Oct. 32(5):710-1. [Medline]. Messer S, Saxena P, Mickelburgh M, Jalali H, Konstantinov IE. Mitral valve replacement in calcified annulus following ring annuloplasty. Asian Cardiovasc Thorac Ann. 2008 Dec. 16(6):488-9. [Medline]. Fulkerson PK, Beaver BM, Auseon JC. Calcification of the mitral annulus: etiology, clinical associations, complications and therapy. Am J Med. 1979 Jun. 66(6):967-77. [Medline]. Jean G, Bresson E, Terrat JC, Vanel T, Hurot JM, Lorriaux C, et al. Peripheral vascular calcification in long-haemodialysis patients: associated factors and survival consequences. Nephrol Dial Transplant. 2009 Mar. 24(3):948-55. [Medline]. Karm D, Marks DS, Wein M, Kong AL. Benign Arterial Calcification on Screening Mammogram: A Marker for Coronary Artery Disease?. J Womens Health (Larchmt). 2015 May 19. [Medline]. Brean HP. Massive calcification in infarcted myocardium. Radiology. 1950. 54:33. Chen JTT. Essentials of Cardiac Roentgenology. 1987. Cooley RN, Schreiber MH. Radiology of the Heart and Great Vessels. 3rd ed. 1978. Crawley IS. Noninvasive diagnosis of pericardial disease. In: Clinical Cardiac Imaging. 521. Spindola-Franco H, Fish B. Radiology of the Heart: Cardiac Imaging in Infants, Children, and Adults. New York: Springer-Verlag. 1985:259. Waller BF, Pinkerton CA, Slack JD. Intravascular ultrasound: a histological study of vessels during life. The new 'gold standard' for vascular imaging. Circulation. 1992 Jun. 85(6):2305-10. [Medline]. Steiner RM, Gross GW, Flicker S. Congenital heart disease in the adult patient: the value of plain film chest radiology. J Thorac Imaging. 1995 Winter. 10(1):1-25. [Medline]. Souza AS, Bream PR, Elliott LP. Chest film detection of coronary artery calcification. The value of the CAC triangle. Radiology. 1978 Oct. 129(1):7-10. [Medline]. Stolzmann P, Scheffel H, Leschka S, Plass A, Baumüller S, Marincek B, et al. Influence of calcifications on diagnostic accuracy of coronary CT angiography using prospective ECG triggering. AJR Am J Roentgenol. 2008 Dec. 191(6):1684-9. [Medline]. Kelley MJ, Newell JD. Chest radiography and cardiac fluoroscopy in coronary artery disease. Cardiol Clin. 1983 Nov. 1(4):575-95. [Medline]. Burgstahler C, Reimann A, Drosch T, Heuschmid M, Brodoefel H, Tsiflikas I, et al. Cardiac dual-source computed tomography in patients with severe coronary calcifications and a high prevalence of coronary artery disease. J Cardiovasc Comput Tomogr. 2007 Dec. 1(3):143-51. [Medline]. Groen JM, Dijkstra H, Greuter MJ, Oudkerk M. Threshold adjusted calcium scoring using CT is less susceptible to cardiac motion and more accurate. Med Phys. 2009 Feb. 36(2):438-46. [Medline]. Ambrose JA, Tannenbaum MA, Alexopoulos D. Angiographic progression of coronary artery disease and the development of myocardial infarction. J Am Coll Cardiol. 1988 Jul. 12(1):56-62. [Medline]. Doppman JL, Rienmuller R, Lissner J. Computed tomography in constrictive pericardial disease. J Comput Assist Tomogr. 1981 Feb. 5(1):1-11. [Medline]. Lippert JA, White CS, Mason AC. Calcification of aortic valve detected incidentally on CT scans: prevalence and clinical significance. AJR Am J Roentgenol. 1995 Jan. 164(1):73-7. [Medline]. Rienmuller R. Detection of coronary artery calcification by computed tomography. Dynamic Cardiovasc Imaging. 1987. 1:139-45. Knez A. New generation computed tomography scanners are equally effective in determining coronary calcium compared to electron beam CT in patients with suspected CAD. Circulation. 1998. 98(suppl):1-65. Bormann JL. Ultrafast tomographic detection of coronary artery calcification as an indicator of stenosis. Am J Card Imaging. 1992. 6:191-6. Breen JF, Sheedy PF 2d, Schwartz RS. Coronary artery calcification detected with ultrafast CT as an indication of coronary artery disease. Radiology. 1992 Nov. 185(2):435-9. [Medline]. Carr JJ. Coronary artery calcium scores correlate strongly between fast gated helical and helical and electron beam computed tomography. Circulation. 1999. 99:1105. Stanford W. Can the absence of coronary calcification on ultrafast CT be used to rule out nonsignificant coronary artery stenosis?. J Am Coll Cardiol. 1995. 19:189A. Detrano R, Hsiai T, Wang S. Prognostic value of coronary calcification and angiographic stenoses in patients undergoing coronary angiography. J Am Coll Cardiol. 1996 Feb. 27(2):285-90. [Medline]. Little WC, Constantinescu M, Applegate RJ. Can coronary angiography predict the site of a subsequent myocardial infarction in patients with mild-to-moderate coronary artery disease?. Circulation. 1988 Nov. 78(5 Pt 1):1157-66. [Medline]. Pencak P, Czerwienska B, Ficek R, Wyskida K, Kujawa-Szewieczek A, Olszanecka-Glinianowicz M, et al. Calcification of coronary arteries and abdominal aorta in relation to traditional and novel risk factors of atherosclerosis in hemodialysis patients. BMC Nephrol. 2013 Jan 14. 14:10. [Medline]. [Full Text]. The authors and editors of eMedicine gratefully acknowledge the contributions of previous author Hani H Abu-Judeh, MD, to the development and writing of this article.